whichever way it opens and whatever it is made of. LockLatch™ is quality assured and comes with a lifetime guarantee. LockLatch™ security latches offer a new layer of improved door and window security to stop opportunistic theft so that you and your family can live in safety and sleep peacefully at night. LockLatch™ stops opportunistic theft so that you and your family can live in safety and sleep peacefully at night. LockLatch™ is an excellent and less expensive alternative to a cat flap or doggie door. Securing any door including a glass sliding door or any window open with Locklatch allows easy access for cats or smaller dogs. LockLatch™ keeps your children safe. It acts as a window restrictor which stops children falling from windows. LockLatch™ prevents windows and doors from slamming and being damaged by the wind. 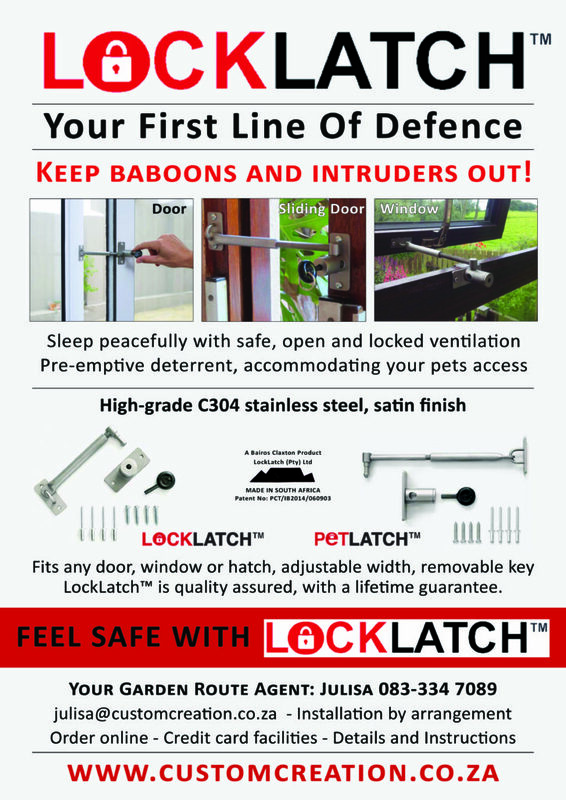 LockLatch™ stops baboons and monkeys from vandalising your house or holiday home. LockLatch™ can be used for the safe and secure ventilation of boats and caravans. In fact LockLatch was invented by Anthony Bairos while he was sailing off the coast of Brazil. LockLatch™ makes the perfect lock for open windows. Locking the bar in place acts as a window stay or window restrictor for any standard opening or sliding window. This allows for the ventilation of fresh air whilst keeping your windows open but secure. LockLatch™’s door latch allows you to leave any door partially open but locked. Our product offers a cost effective solution when securing any door including a patio door or sliding door. 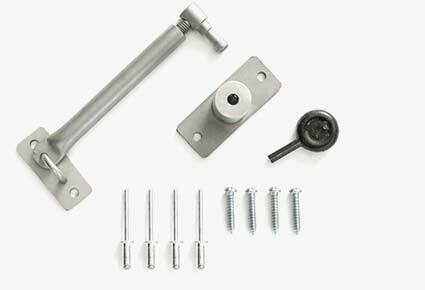 LockLatch™ fits all aluminium, steel, PVC and wooden windows and doors with an adjustable 11 – 18 cm gap for LockLatch and 16 -21 cm for PetLatch to suit your needs. LockLatch™ is made from high-grade C304 toughened stainless steel that’s hacksaw and rust resistant and comes with a lifetime guarantee. For your convenience, we include one-way screws and pop rivets with every LockLatch™ we deliver. LockLatch™ is very easy to spray paint in any colour you wish. So it’s easy to match the colour of your frame or home interior.